General Release Notes from the September 10th 2015 update. Implemented the ability to print an encounter’s invoice screen. From the Invoice tab, click the Printer icon on the right-hand corner of the screen and select either Save to PDF or Send to Printer. Implemented the ability to add words to the practice dictionary. In a visit note, when a word has been misspelled, right-click on this word then select Add to Dictionary. To edit the practice dictionary, right-click on a misspelled word then select Options > Spell Checking Dictionaries > User Dictionaries > Select the dictionary to edit and select Edit. This will function identically to most word processing software. Made changes to the Split Payment posting screen (Patient and Insurance payments) that now allow a claim preview to appear along the bottom of the payment posting screen. This has replaced the applied payments portion. To view the applied payments, click Show Applied in the upper right-hand corner of the window. Implemented the ability to import/export bulk fee schedules. To import a fee schedule, click on the Properties tab > Insurance > Import > Fee Schedule > Open > Select a file > Import. To export a fee schedule, search for the insurance you would like to export, then click Export > Fee Schedule > Save the file. Implemented a new tab into the Insurance Payment window, called Patient Responsible, which will allow the user to manipulate the patient responsible status on line items that this check has been posted to. Implemented the ability to bulk import and export insurance companies. 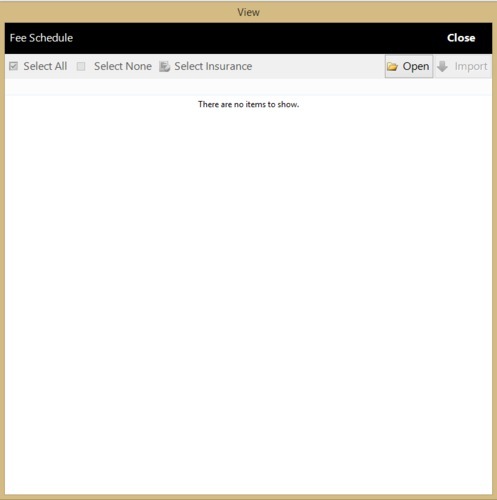 To import insurances, click on the Properties tab > Insurance > Import > Insurance > Open > Select a file > Import. To export, search for the insurances you would like to export, then click Export > Insurance > Save the file. Implemented a new setting under Options > Billing that will allow the user to default the view on the Invoice tab of the encounter to either Charges (default), Charges (Edit Mode), or Payments. Reorganized the columns on the billing dashboard Encounters screen to better improve workflow for smaller resolutions. The following columns have been moved to the far right: Encounter Number, Template, Secondary, Tertiary. All other columns have moved to the left to compensate. Implemented automatic updates. The user will be prompted to download an update upon entering TRAKnet if an update is available. 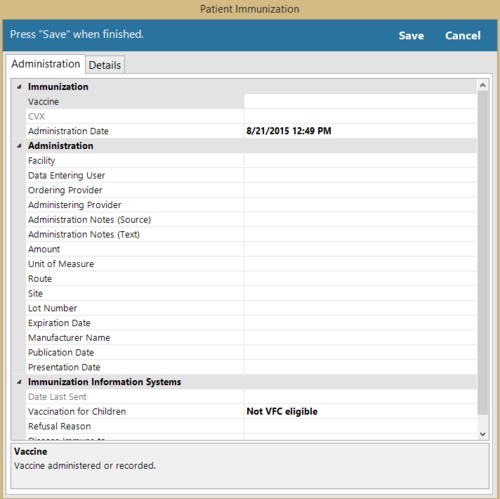 Implemented a place on the patient’s chart to document immunizations. This can be found under Actions > Immunizations > Add. Implemented the ability to create UB04, or Institutional, claims. For more information about Institutional billing and the set up required, please check the wiki article about this. Implemented the ability to filter Inactive patients when accepting a patient payment. ICD-10 testing has been activated. 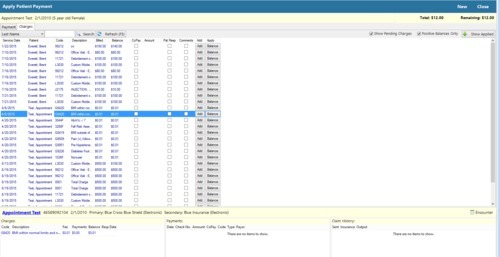 For a walkthrough on how to complete ICD-10 testing with TriZetto, please refer this this walkthrough: http://wiki.traknetsolutions.com/wiki:icd-10-testing. Changed the workflow when charting a visit note. When using the tab blanks feature, the next multiple choice field will open automatically. All fields will now open on the right-hand side of the screen, rather than the center of the window, and will no longer obstruct the body of the visit note. This has been done to improve workflow and general quality of life while charting. Implemented a How-To button on several screens in TRAKnet. This button will be located in the upper right-hand corner of most screens and will link to any related wiki pages regarding that screen. Resolved an issue where the footer date on a printed encounter was showing the date last modified, not the date of service. Resolved an issue where patient encounters were not properly associating themselves to the Legal Representative’s ledger. Resolved an issue where the integrated patient eligibility feature was not automatically refreshing with new information about the patient. Resolved an issue which prevented the taxonomy code from printing in box 24J Shaded if the setting for the qualifier was set to False. Resolved an issue that prevented the user from editing the insurance subscriber’s social security number. Resolved an issue where the Date link in a Collection letter was preventing the rest of the letter from printing. Resolved an issue which prevented the Claims History screen from being printed. Resolved an issue where SmartSheets which had an apostrophe in the name would not display any codes. Resolved an issue which prevented the user from changing the Claim Date in Box 31 of a CMS 1500 form. Resolved several minor issues with display names on various pop-up windows. Resolved an issue which prevented the user from clicking Save & Close on an encounter which was created in 2.0. Resolved an issue where the claim check in the encounter was incorrectly displaying errors referring to prior authorization number start and end dates. Resolved an issue where cancelled appointments were showing as Missed when viewed in the Appointments tab of the Appointment Editor window. Resolved an issue where a patient could be set as their own legal representative and then could not be removed. Resolved an issue where patient insurance records that had invalid dates would not open. Resolved an issue where the patient invoice was not automatically updating to reflect any information added to the Claim Details tab of an Encounter. Resolved an issue behind the scenes which sometimes occurred when setting the Remit To location for statements. Resolved an issue where, if a claim adjustment code was missing from the database, no other claim adjustment messages would be displayed after the missing code. Resolved an issue behind the scenes with the Payments view of the invoice. Resolved an issue where it was previously impossible to send a ProviderID with an eligibility request. This has been implemented under Properties > Insurance > Claim Details > Eligibility. Resolved an issue where modifying an appointment then rapidly changing the duration and date would cause the time to become empty. Resolved an issue where encounters would sometimes not become signed on the first click of Sign & Close, forcing the user to reopen the encounter and Save & Close once more. Removed several Links that had no current use or were not working properly. Resolved an issue where TigerView would not open when launched from TRAKnet. Resolved an issue where the «VisitProvider» link on a Superbill was not populating with the encounter’s provider. Resolve an issue where setting a date terminated for a user was not always preventing them from logging in. Resolved an issue where the authorization number for a credit card would not populate. Resolved an issue where the header in an encounter was disappearing when using the Copy Visit option.